Jennifer Samson, CRNP, grew up in Spanish Fort, Alabama. She received her Bachelors of Science in Nursing at the University of South Alabama and worked as a Registered Nurse in cardiology before earning her Masters of Science in Nursing with a Family Nurse Practitioner concentration from the University of Alabama at Birmingham. She is board certified by the American Academy of Nurse Practitioners as a Family Nurse Practitioner. She is also a member of the American Academy of Nurse Practitioners and Sigma Theta Tau International Honor Society of Nursing. 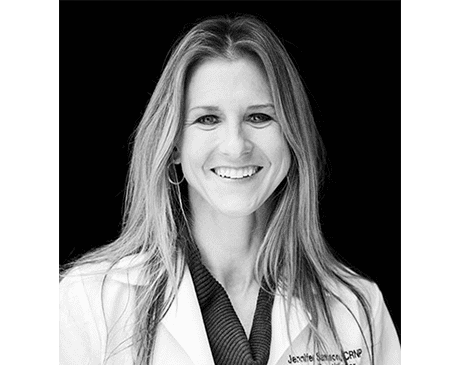 Jennifer has comprehensive training in the field of dermatology, including extensive training and mentorship under Dr. Bailey in the diagnosis and treatment of diseases of the skin. She performs comprehensive skin exams, biopsies, cryotherapy, chemotherapy wraps, UNA-Boot applications, as well as other procedures, and she works with Dr. Bailey to build strong, trusted relationships with patients and provide a plan of care to best manage their skin condition. She also assists Dr. Bailey in skin cancer and reconstruction surgeries. Jennifer and her husband Vince currently reside in McCalla, Alabama. She enjoys traveling, running, and Crossfit.